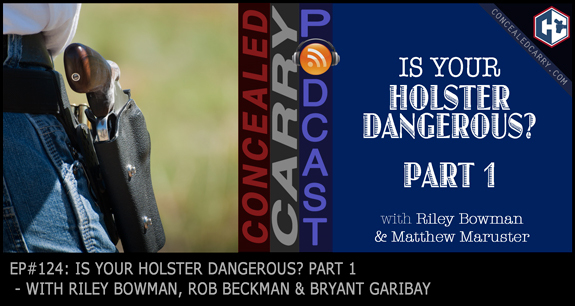 Riley gets together with Matthew Maruster to talk about a video Matthew did recently about “dangerous” holsters. We share two experiences where people shot themselves due to problems with their holsters. To learn what these problems were and how to avoid being the next casualty, press ‘PLAY' above to listen now! Sports Afield. Once every 30 seconds in this country a home invasion occurs, have you ever considered how you would access your gun quickly in a home invasion while still keeping your firearms stored securely? The Sports Afield line of quick access handgun safes are perfect for the task. They are foam-lined yet built with heavy-duty 16 gauge steel that will keep your firearms protected and still allow you to quickly access them in an emergency with the reliable custom-programmable 4-button keypad. A line of full-size rifle safes are also now available that makes shipping and delivery easy! Trust this 100-yr-old brand (yes, the same company that has published the Sports Afield magazine since 1887) with your firearm storage and security needs. See the full line-up at: www.concealedcarry.com/sportsafield and for a limited time save 10% with the coupon code we give in today's episode! Riley – Sunscreen…at least 50 SPF! I just read the article abiut Matt, I wish him a quick recovery. There are two things that come to mind. I have been a part time concealed carrier for about 20 years. I have carried full time for about 10. why wi went from part time to full time, is a different story. Yes a model specific molded carry holster goes along way to solve this problem. I carry a Cross Breed leather Kydex. Works well, is comfortable and I have had absoutly no issues. The second is the firearm itself. I carry what some feel is a dinasour. I carry a 1911 45. Because of the manual safety and the grip safety it is much less likly to have a neglegent discharge then most guns. Yes I carry with a round in the chamber and will continue to do so. because of the combination of firarm and holster, this kind of discharge in nearly inpossible. CKeep your gear in good shape. Never take for granted the condition of your firearm and use a firearm that has multiple levels of safeties.